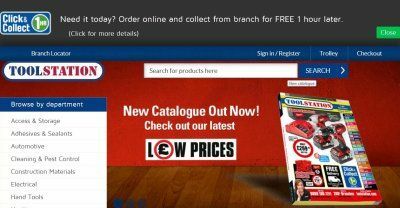 Toolstation.com is one of the best online shops according to a major new Which? survey - and homebase.co.uk is one of the worst. The consumer champion conducted its largest ever survey on online shopping experiences, speaking to more than 10,000 members of the public. They were asked to rate online retailers on factors including price, deliveries, quality, ease of finding products, satisfaction with the product or service and the likelihood of recommending the product or service to someone else. White-goods retailer ao.com and beauty specialist lizearle.com emerged as the overall joint top online retailers, with a score of 87% each, with customers praising their speed and efficiency. Toolstation was just behind with an 85% score, beating johnlewis.com with 84% into fourth place. At the other end of the scale, coming 97th out of 100, was Homebase's website, with a score of just 60%. Which? editor Richard Headland said: "Online shopping is booming because it can be more convenient, better value and offers a greater choice of products. "However, there is a big difference between the brands at the top and the bottom of our table, suggesting some sites need to be a lot more switched on to what their customers want." The survey also revealed that while shoppers buy online for convenience price is the top factor when people decide which website to use, with nearly four in 10 saying this is the most important. Other online retailers voted top in the survey were, from fifth place down, wiggle.co.uk, the bodyshop.com, allbeauty.com, ebuyer.com, fragrancedirect.co.uk, amazon.co.uk and maccosmetics.co.uk. The worst retailers were O2.co.uk, mamasandpapas.com, zavvi.com, whsmith.co.uk, lauraashley.com, hm.com, pcworld.co.uk, homebase.co.uk, vodafone.co.uk, evanscycles.com and, at the bottom, ee.co.uk. This was my first visit to toolstation in farnham but it will definatly not be my last the service was exceptional staff were welcoming i was immediatly greeted and offered assistance and a free hot drink while i waited they even carried the paint i bought to my car for me :). I Visited the Rochdale branch on the 12/05/18. Great service, Gee was very friendly and helpful. I Will call again. Unfortunatly I cannot remember the young ladies name who served me, but she was very polite and efficient with a lovely smile, it was a pleasure to do business at Toolstation, Bournemouth. Been into Kirkcaldy store twice .Service first class returned goods with no problem .The staff always friendly and so helpful .Wiil definately use them again . Visited Toolstation Sloper Raod Cardiff today to purchase plumbing products. I was served by a young lady who was an excellent asset to your company. The young lady was polite, cheerful, knowligble about the products I wanted to buy and extermely helpful. She was a credit to your company and I would like to thank her and your company for such a positive expreience. Thank you. I had great sales exerience at you Kettering bransh.i got every product i needed your sales girl Stacy was very friendly helpful.I will shop at Kettering store in the near future. Second time i have visited the store in Dagenham (Rainham road), was served by a happy, smiley, polite, courteous and professional young woman named Charlie, she was very helpful and sorted out my order with no issues. Charlie your a credit to Toolstation. I visit this store quite often,and i've always received brilliant service and very polite and helpful staff, they are a credit to your company!! This is the first time I have visited one of your branches having previously always ordered on the telephone. Now with your new branch at Saltash. I found great service polite helpful staff, modern layout for a quick turn around. I will be back again. Great.